It seems like I should have allowed two votes here since the winner was never really in question. Still, interesting to see a two-way tie for second, as well as a handful of scattered votes for other films. This also serves as a reminder that I need to revisit Natural Born Killers at some point. This Week’s Poll: Well, we all know what’s going on this weekend, and this week’s poll fits in with the summer’s biggest film event. The winner of this poll is likely already a given, but I’m holding out hope for a surprise or two. Instead, of asking what the *best* Batman film is, I want to know what your *favorite* is. If you enjoy getting drunk with your buddies and watching Batman & Robin more than anything, then by all means go ahead and vote for that. What Batman movie do you come back to the most? As a new addendum to the weekly poll results, I am going to start including a brief weekend roundup. I have been meaning to add more of a “personal” feel to The Warning Sign, and this is as good of way as any. Friday: After grabbing some pizza with friends, I headed over to a local bar for a movie blogger meetup. Ryan from The Matinee was visiting from Toronto, and he was cool enough to set up a gathering of Chicago bloggers (including the creative minds behind Cinema Romantico, Duke & the Movies, All Eyes on Screen, Commentary Track and Film Yarn) for some beers and a movie. It was a lot of fun meeting everyone, and it felt great to shed that bit of anonymity that communicating online provides. Plus, you can’t ask for a better nightcap film than freakin’ RoboCop on the big screen! Never get tired of that. Saturday & Sunday: I worked more than anticipated this weekend, but I was able to squeeze in a few films (all on DVD or streaming). I finally saw last year’s Tinker, Tailor, Soldier, Spy, which unfortunately didn’t connect with me the way I hoped. I had little interest in any of the characters, and the film’s methodical pacing didn’t help. Gary Oldman, however, was incredible, and certainly deserving of his many accolades for that role. I also caught Rampart, which had a strong Woody Harrelson performance but the film itself wasn’t nearly as good as other likeminded films such as Abel Ferrara’s Bad Lieutenant or Werner Herzog’s Bad Lieutenant: Port of Call New Orleans. Finally, I saw Herzog’s documentary, Cave of Forgotten Dreams. This film had a really interesting subject, but quite frankly should have not been stretched into a 90 minute feature. I feel that it would have benefited from a 3D viewing, however. Outside of RoboCop on the big screen, my movie viewing weekend was a bit of a dud. How about you guys? Did you see anything good over the weekend? Any thoughts on the poll and/or results? No sure there’ll be much of a surprise in this week’s poll! I was torn between Begins, Returns and Dark Knight but I have to go with the latter. The Dark Knight is definitely the odds-on favorite this time, but it looks like most of the others are getting some votes as well. I’m hoping we get a surprise or two. Stone is very hit and miss with me. I admire his work in ‘Platoon’. Not for the story, but for Dale Dye’s technical expertise in getting a bunch of unknowns to look, act and behave like a bunch of grunts in the field. With their flashes, shoulder tabs and stripes in the right place above bleached boots. Very doubtful an NCO like Tom Berenger’s Sgt. Barnes would be top kicking a platoon for long with an open vendetta against Elias going on. More likely, a trip to the stockade at LBJ (Long Bihn Jail). Also appreciate that a director finally got the feel of the WTF!!! ‘Mad Minute’ of a firefight at zero dark thirty is like. Hi Jack, great to hear from you. I’m with you on Stone — it’s either all or nothing with him, I think. 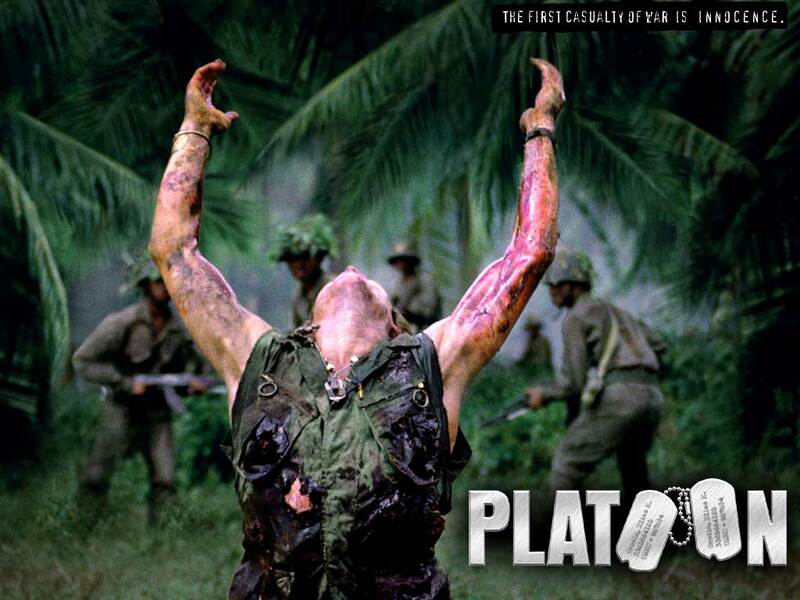 Platoon has him on top of his game and it’s one of a very select group of films that I would not hesitate to give a 10/10 to. I would like to sit down and listen to the two different DVD commentaries available — one by Stone, and one by Dale. I can only imagine the insight they share on those tracks. I recently watched “Jarhead” and I loved it! Nice! I think that’s one of the more underrated modern war films. I thought that most people would go Platoon, I personally think it hold up well today. Absolutely. Gave it another viewing a couple years ago and it blew me away even more than the first time I saw it. Incredible film. Oh, sweet! You can’t beat Arrested Development. Are you excited for the Netflix relaunch? Absolutely! I’m so glad new season of AD is happening in 2013 – after such a long time it seemed unlikely. Sounds like a dark collection of films! What did you think of Black Death? I have heard very mixed reviews but I know a couple of people who loved it. It’s sitting in my queue… wondering if I should bump it up. Ah, I see that you have already wrote a review for Black Death. Guess that answers my question. 😀 Will give it a read shortly. Nice weekend! Getting jealous of all of your guys bloggy get togethers over there. I was a fan of Tinker Tailor. Solid film. Hurt my brain, for sure. But loved it. I have noticed that it hasn’t been as well received by film fans over your side than it was over here. Jaina, that’s a good point about Tinker Tailor. I know a lot of people over here loved it, but it seems there are many with similar complaints. I may have to give it another watch someday. As far as Batman Begins, I can definitely see where you’re coming from. I will be revisiting both films this week (hopefully), as I am curious if I will feel the same way with a few years perspective. Great weekend roundup man, looking forward for more! That’s cool you got to meet some fellow movie bloggers. Talking of Chicago, there have been some pretty good movies set in that city (an idea for a blogpost?) I recently saw Henry: Portrait of a serial killer (1986), which was well-made and creepy, just not a great ad for visiting…! That’s a great idea for a Chicago-themed blog post. I might give it a shot someday. Man, isn’t Henry messed up?!? I just saw that a couple months ago and I totally agree with your sentiments. A highly disturbing film, but surprisingly well-made on its micro budget.